I love when two mismatched things find each other and live in perfect harmony. So I had an extra picture frame that was just itching to be made into something beautiful. 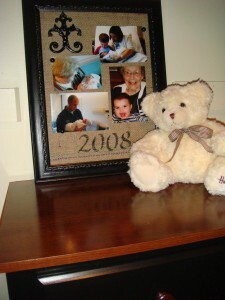 Although this was a sad frame because it didn’t have any backing or glass insert. “Trash,” you say. “Treasure,” I thought. 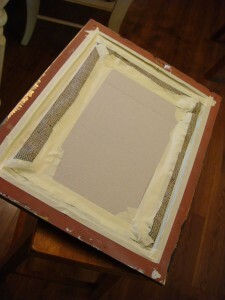 I spray painted the frame, and wrapped an extra piece of plain cardboard with burlap. Now where did I find this burlap? I had a small kit filled with games for preschoolers and one of the activities was a burlap sack to practice relay races and jumping skills. Of course I had my son practice a couple times, and he did so well, I took the scissors to it. Everyone wins right? Remember my Edward Masking Tape Hands issue with my Procrastination Picture? Well it came out again. I just think of my skill with masking tape similar to the Nesters skill with a hot glue gun. That’s all. Didn’t even need a backing. Then the fun part began where I simply painted in the stenciled numbers with the year my son was born, added my sacred pictures, and now it rests on a dresser in his closet. 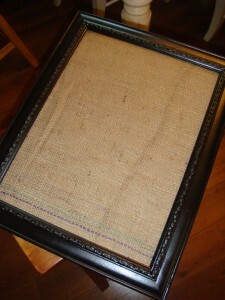 Easy, breezy, beautiful… covered burlap frame. 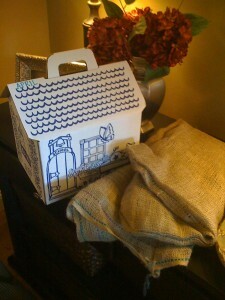 I’m linking this one to Rhonda @ Southern Hospitality’s Burlap Party today. She has actually covered lamp shades with burlap and added a monogram. I’m in love! Check out her cute projects and add your own! 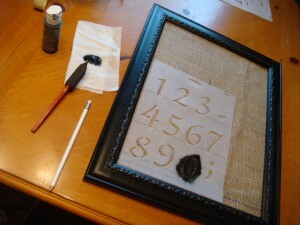 What a cute idea and burlap project! I love it! Great project! It looks great! Simple and elegant - I love it! What a wonderful idea! How sweet it is! Love the stenciling! ,, that is soo cute,, now I wanna rip mine apart and do something like this,, looks good. very clever idea! I did one similar but took apart an old wicker looking shade and used the material. Love this!!! 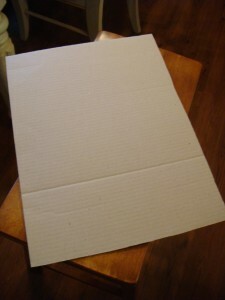 I think I can actually complete this project!!! I really like this! Im going to try it. It looks so classic. Good Job. Super fabulous! I can not wait to try this at home. 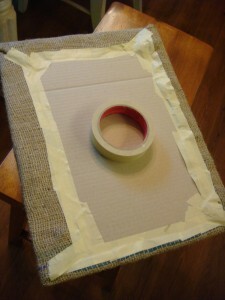 I just got a few yards of burlap and have some left over. Thanks for sharing! This frame turned out beautifully! Great idea. Love your sense of humor, BTW. Katie, that is absolutely adorable. Thanks for joining the party today & I hope you’ll come back often. I love this idea. I am going to give this a try. Thank you so much for sharing. 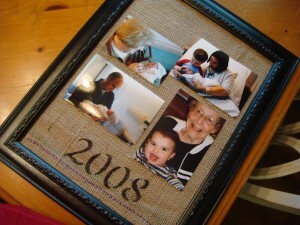 Great burlap project!! Love the frame. Thanks so much for sharing!! 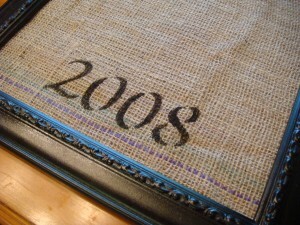 Love the tutorial and the year on the burlap!